Discussion in 'Online Games - News and Reviews' started by Kotsy, Sep 2, 2014. Another great Jackpot video slot from Novomatic featuring Slot Studios! Garden of Riches which is part of the series of available Jackpots at Stargames just waiting to be hit. Many think that they will never hit that Jackpot, but eventually someone has to win. Jackpots get hit left and right and you'll never have the chance if you don't play. 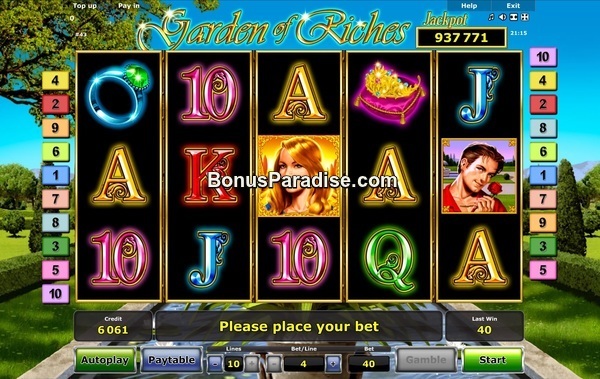 With Garden of Riches the odds of hitting it are the same with any other Jackpot. but I do think it could be her. Anyway, this slot game has a very handsome and loving couple that could make all your dreams come true. Even the brilliance of all the symbols is quite eye catching. Everything seems to illuminate and makes all stand out. Novomatic really brought the graphics and sounds to the forefront with this one from Slot Studios. featured games to even the newbies will see how easy it is to play here. radiate royalty. It offers the player 10 playlines, but you have the choice as to how many you play. In order to hit the Jackpot, all lines must be in active play. It is spread out amongst 5 reels and 3 rows. The ultimate prize comes when your screen is filled with the beautiful and alluring girl. Imagine seeing your whole screen of that beautiful creature! All wins will pay left to right except our "Princess" who is the Scatter symbol and can payout anywhere on the lines when 3 or more are received. It also starts the chance at the Jackpot but, she doesn't end there. Read on about our fabulous gal. Basic winning symbols include, Scatter, which also can be wild and substitute for all symbols, handsome man, pillow with crown, ring, yellow rose, Ace, King, Queen, Jack and Ten. The Jackpot and highest winnings in the game are our "Princess" or Lady as many regard her. She has the power to bring you substantial winnings and to start the feature for your chance at the Jackpot. Here's your chance of achieving some incredible winnings and shoot for the Jackpot. winning paylines and the chance at the Jackpot. In order to hit the Jackpot, players must be playing the maximum amount per spin and all reels and lines must show the Scatter symbol. You must have all fifteen Scatter symbols on the lines. It may seem elusive, but it does happen. along the way of achieving the ultimate Jackpot. Stargames has brought you another nice video slot with the Jackpot feature. This is a really great new online slot! I absolutely love it! Will sure try my luck more times on Garden of Riches at Stargames Casino. I like the Slot a lot. I had yesterday 2 times the Free Spins, and each round paid over 500X. Next time i make some screenshots! Congrats on your nice win, you see, Garden of Riches is not a boring Slot. The free spins feature can be really exciting! Goldharry and Mike like this. Thank you GoldHarry for sharing this awesome screenshot. What a nice win! Wow, just saw this Goldharry. Nice hit.